SoftPLC offers a low cost, distributed I/O product line, which we call the "A Series". Modules are available for ethernet and serial networks. Also available in this product line are unmanaged ethernet switches and media converters. All A-Series products are compact, DIN rail mountable, and can be mounted side-by-side or stacked piggy-back atop each other for small physical space applications. The A-Series modules provide cost-effective protection and conditioning for a wide range of industrial control signals and systems. These modules are ideal when you have only a few I/O points, or need to distribute a small number of I/O points in several locations and you don't want to incur the overhead/cabling cost of a fieldbus network (eg: Profibus or DeviceNet). Applications include HVAC controls, sorting conveyors, utilities, and remote installations. One example is a weather station: the SoftPLC controller is installed atop a mountain and uses the A-Series I/O to monitor weather conditions (eg: temperature, wind speed/direction, humidity), which are made available to the public via a SoftPLC-based web page. A-Series I/O modules are a family of compact and networkable data acquisition and control modules, with a wide range of available analog and digital input/output signal types. All modules are designed for reliable operation in harsh environments and are equipped with isolation and failure protection, and high resistance against noise-interference. The "robust" serial modules (Models ASIO-41xx) can operate in temperatures from -40 to 85°C. Ethernet modules are available for ModbusTCP (Models AEIO-60xx) and EthernetIP (Models AEIO-61xxEI) protocols. Dual Ethernet port modules (Models AEIO-62xx, AEIO-61xxEI) can be easily daisy-chained without the need for ethernet switches. The Serial modules (Models ASIO-4xxx) use RS-485, the industry's most widely used bi-directional, balanced transmission line standard. Some serial modules support the ModbusRTU protocol, while all modules also support a proprietary serial protocol for which SoftPLC Corporation has developed drivers for our SoftPLC controllers. Individual module data sheets can be obtained from the Modules tabs. 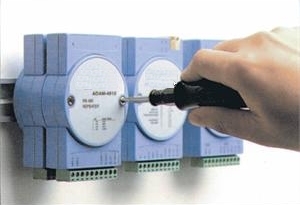 The links below are general specification documents and manuals for the drivers used to connect SoftPLC controllers to A-Series I/O. SoftPLC's ModbusTCP Master Driver supports most modbus commands on TCP/IP and UDP/IP. 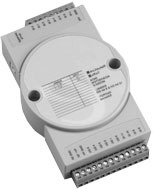 Can be used with A-Series modules I/O that support ModbusTCP (Models AEIO-60xx, AEIO-62xx). SoftPLC drivers for serial RS-485 A-Series modules (Models ASIO-4xxx).